While everyone thought he won’t file for divorce because there was no wedding, a proving legal document has emerged. The document shows that Ashton Kutcher and Demi Moore were in fact legally married. The paper obtained by In Touch, says that the owner of a piece of real property, called the grantor, transfers his or her interest to a recipient, called the grantee. 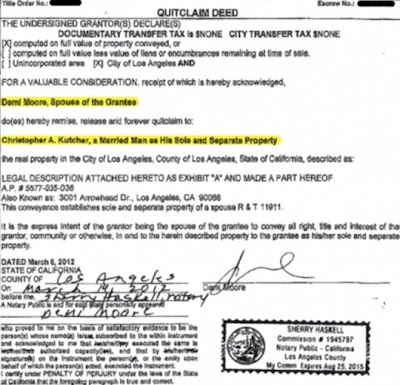 The document shows that Demi gave up her claim to a piece of property in Los Angeles. The paper was signed this March, months after the two split. That means, they are finding their own way of divvying up their assets. 49-year-old Demi split from 34-year-old Ashton in November 2011. The reason? He cheated on her with party girl Sara Leal. “As a woman, a mother and a wife, there are certain values and vows that I hold sacred, and it is in this spirit that I have chosen to move forward with my life”, Demi said at the time.Soon after she made the announcement, Ashton responded via Twitter. “I will forever cherish the time I spent with Demi. Marriage is one of the most difficult things in the world and unfortunately sometimes they fail. Love and Light, AK”, he wrote. The two wed in September 2005. Demi was previously married to Bruce Willis from 1987 until 2000. The former couple has three children together: Rumer, 24, Scout, 21, and Tallulah 18. In 2009, Willis married Emma Heming. This year they welcomed a baby girl. According to reports, Demi is worth $150m, while Ashton’s fortune is said to be worth $140m. Following the split, Demi suffered a break down and she entered rehab for treatment. Meanwhile, Ashton began dating ‘That 70′s Show’ co-star Mila Kunis. 2 comments for "Demi Moore, Ashton Kutcher Are Legally Married"